Joanne was given her first Canary at the age of 8 by the church house keeper as payment for cleaning the parish rectory. 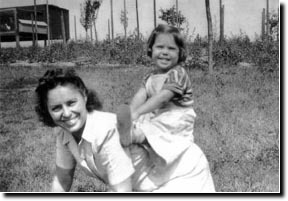 Her father and uncle were top Pigeon Racers as young men and her parents raised chickens and turkeys in their back yard, as seen in the corner of this photo of Joanne and her Mom. She often remarks that "...Birds are in my genes." She grew up in Pittsburgh Pennsylvania with two sisters and a brother. After spending 23 years in Corporate America, she opened her own Art Gallery, retiring 12 years ago to raise canaries. When she moved to Southern California, she couldn�t wait to set up her Canaries in outdoor flights. Two years in a row she lost almost all her birds to the Canary Pox. She was heartbroken. Through research she found that finches do not get the pox. Gouldians became her next love. She was warned not to raise this bird because it was weak and temperamental, requiring controlled temperature and humidity. Then she saw an ad in the local newspaper by a Gouldian breeder, Joanne made an appointment to visit his aviary and observed how successfully he had raised his Gouldians outdoors. She purchased three pairs and was on her way! Joanne never raised her Gouldians in a controlled environment. Because the Gouldians come from an arid part of Australia, California is a perfect place to raise them outdoors. 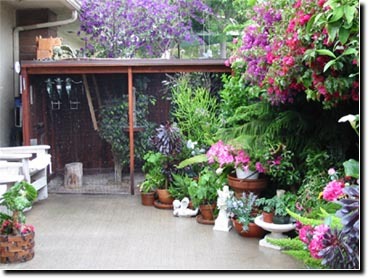 In the winter months the temperatures in Southern California can vary from 40 degrees low to 80 degree high. The relative humidity averages from 80% in the mornings to 54% in the afternoon. Most of the birds do not use the heated perches that she supplies during the coldest of the winter months. In this environment her birds flourish. After breeding Gouldians for several years, Joanne gave her sister Laraine her first breeding pairs and invited her to join in her new venture of raising Lady Gouldian Finches. The rest is history. They launched ladygouldianfinch.com over 10 years ago and took the guess work out of raising Lady Gouldian Finches. 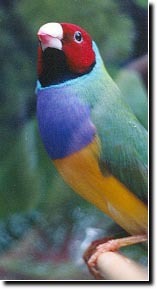 Ladygouldianfinch.com is the last word on Gouldians. The sight is highly respected and esteemed by both aviculturists and avian veterinarians for the sound advice from years of experience. They are able to help you avoid common pitfalls and deadly, costly mistakes. Two years ago it was time for Laraine to move on and pursue her new individual interests. Joanne started with a Canary as a hobby. Over the years it became her passion and now it is a successful business. Because of the responsibilities Joanne has in managing www.ladygouldianfinch.com on a daily basis, she is unable to offer the proper attention required to raise her beautiful birds at this time. She works closely with top breeders, customers, veterinarians and organizations for the testing of new products. Canaries and Finches are still her passion after 61 years. As an aviculturist her goal is to share the knowledge that she gained from other breeders over the years to help promote the well being of these beautiful creatures.